Every hour that you put into enhancing user experience while developing a site is a hour well spent. There are numerous small improvements that you can perform to make things easier and obvious for the end user. In this article I will present a jQuery plugin built for that purpose. 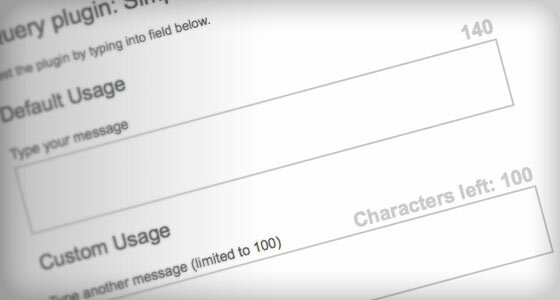 On your site you might have a comment box or contact form fields limited to certain character count. You can use this simple plugin to provide user with that useful information. The first thing that this plugin do is create a sibling element (it adds is immediately AFTER the form element), the "counter", where the remaining character info is stored. On each key up event or text field value change the counting function is triggered and the contents of this "counter" element is changed accordingly. If the remaining character count reaches the "warning" zone (gets close to zero) the CSS class is added. We use this class to change the color of the character count info. If the count reaches zero and goes beyond it another class is added so we can use another style for exceeding the limit. The character limit you wish to set for your text area or input field. It must be a number. When remaining characters reach the number set with this option the "warning" css class name will be applied to the counter element. Class name added to the counter element. Use this class name as a css selector to describe element’s appearance. Class name added to the counter element once the character count reaches the "warning" number. Class name added to the counter element once the character count reaches zero. If you wish to add some text before the remaining character number, you can do so by using this option. It is empty by default. Since I am (always) wrapping the label and form element into a div, I positioned the counter absolutely in relation to the containing div. You can visit the demo page to see this plugin in action or you can download the plugin package. Let us know your thoughts. Nice & simple. Thanks for the sharing! its buggy with mouse right click -> Paste. @B: it should work... what's the bug? Nice tips, very helpful ! thanks for sharing ! @B - to be fair, twitter's also doesn't account for mouse right click -> paste. @cssglobe but there's more instances: 1) select some text and click drag drop on the text input. 2) right click -> cut 3) in OS X (I believe maybe in FF Windows), right click to correct spelling 4 ???) if you use this on a field that the browser will prefill, does it work? If any of these situations seem like corner cases, keep in mind accessibility :) The only way I've found to accurately do a character count on an input is to run a task and poll the input every 500ms. @waynep This would also solve the the 'long key press bug' that this also doesn't account for. Simply put, hold down a key, it counts the first character, but not the ones after. Then the counter updates upon key release. jQuery offers a mechanism for adding in methods and functionality, bundled as plugins. Most of the methods and functions included in the default download are written using the jQuery plugin construct.The navigation-option automatically activates a part of the accordion based on the current location (URL) of the page. Nice script, little but effective script. thanks very much sharing. Hi, I am Ogaaaan from ja_JP. I hope adding property "minimum". if user value was not reached 5 characters, i want to display browser "Please enter at least 5 characters". best regards. Thanks for spending time to create this awesome post.. You made my day...! !